The potato is by far America’s favorite subterranean vegetable, but many others have much more nutrition and flavor. For many of us, the first encounter with a new vegetable meets with suspicion or disgust, and weird roots can be especially off-putting. Unfamiliar gnarled and knobby shapes pulled from the dirt may not immediately register as food. But if you have a sense of adventure, you may be surprised and even come to love the different tastes and textures that grow underground. Outside of spuds and carrots there is a wide world of roots, tubers, and rhizomes that can add a lot of dimension and diversity to your diet. Thanks to foodies and farmers’ markets, more people are stepping out of the shadows of the modern starch monoculture and embracing our ancestors’ favorite edible roots with renewed interest. Our first peek below the surface considers the somewhat familiar: parsley root. Beneath the green garnish is a root that looks like a white carrot. 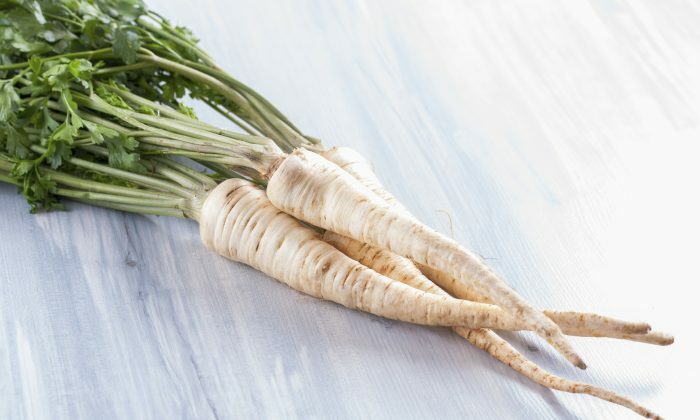 While consumption is rare in the United States, parsley root remains a popular vegetable throughout Central and Eastern Europe. Parsley belongs to the carrot family, and its roots can be used similarly—raw or cooked. 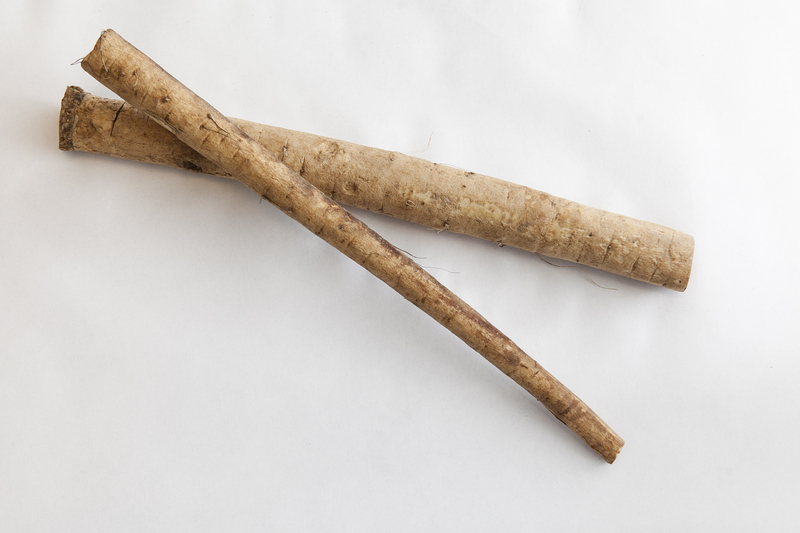 Sometimes confused with a parsnip, parsley root is more slender and less sweet with a mild parsley note. You can roast parsley roots, mash them with butter, toss them in a soup or stew, or grate them into a salad. Parsley root is high in vitamins A, C, and K and can help relieve gas. Like carrots, peeling is not necessary. 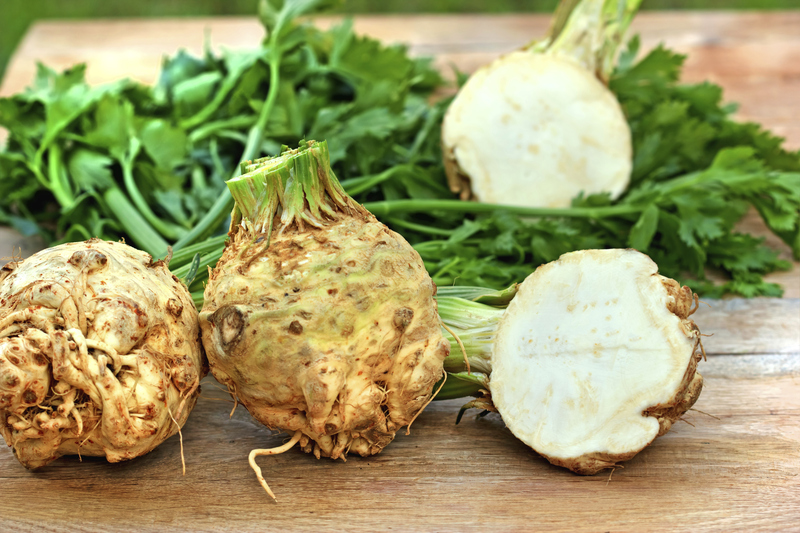 Also known as celery root, celeriac is another carrot relative, but looks nothing like a carrot or celery—more like a matted tangle of hair and tendrils. After you discard the rustic peel, you’ll find a solid white flesh and familiar celery taste, but with a starchier texture. Cooked, celeriac can serve as a potato alternative—mashed or as cream of celeriac soup—but you can also use it raw. Try the classic French salad celeri remoulade, which consists of grated celeriac with mayonnaise, mustard, and lemon juice. Salt and pepper to taste. Celeriac is a good source of fiber, potassium, and vitamin C, but much lower in starch and calories compared to other root vegetables. Below the beautiful lotus flower grows an architecturally unique root that is mild, crunchy, and slightly sweet—similar to water chestnuts. This creamy-white rhizome grows not only underground, but in the mud underwater. Inside the lotus root are several hollow chambers where the plant stores its seeds. This vegetable is often cut into thin cross-section slices to make the most of its unique shape. Lotus root is a good source of vitamin C, B vitamins, minerals, and potassium and is used throughout Southeast Asia as both a food and medicine. Chinese herbalists use lotus root to calm the nervous system and strengthen the lungs. 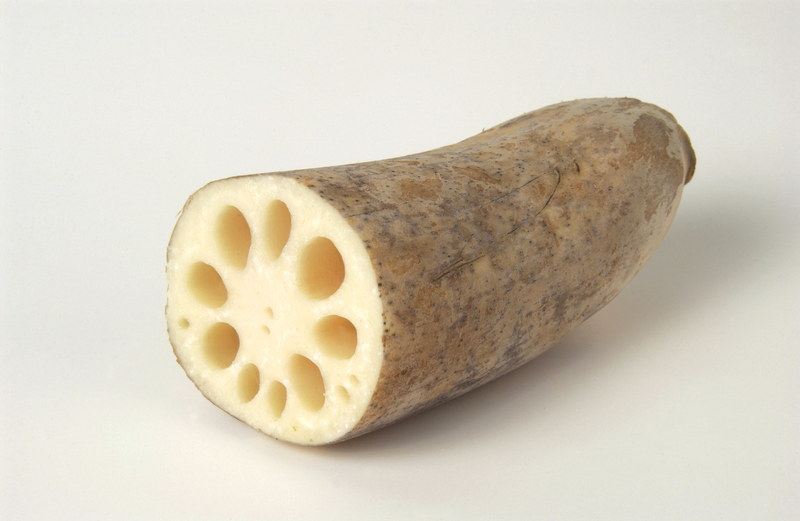 Available year round at Asian grocery stores and specialty markets, lotus roots come peeled and wrapped in plastic, or canned. If you find fresh lotus (harvest starts in late summer), be sure to remove the tough, bitter peel and trim off the hard ends. Lotus can be boiled, fried (tempura), stewed, or even eaten raw. Burdock grows wild across the United States, but aside from macrobiotic adherents, few Americans realize that the large-leafed plant is also a food source. Best known for its Velcro-like burrs, burdock also has a long root with a complex, earthy flavor that can be an acquired taste. 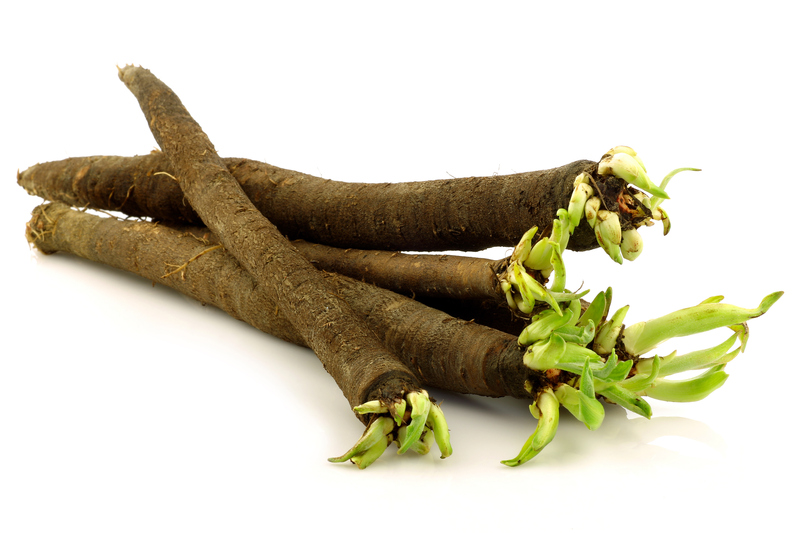 In Japan, where burdock goes by the name gobo, the root is cultivated like carrots. Burdock works best in small amounts. One recipe with wide appeal is equal parts grated burdock and carrot, mixed with sesame seeds and soy sauce, and stir fried until soft—an excellent condiment for brown rice. Like lotus, burdock has also served as a medicine. Considered the most yang of vegetables in the macrobiotic diet system, burdock is used in herbal traditions as a blood cleanser and kidney tonic. 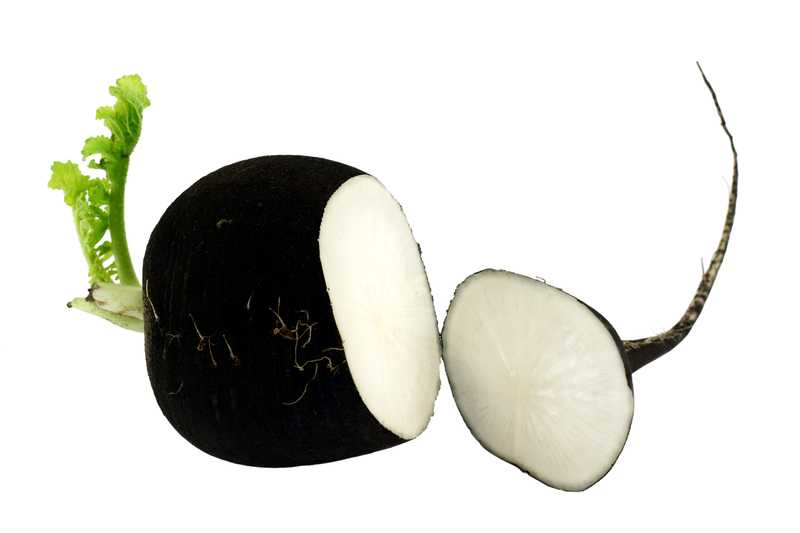 Also known as Spanish radish, a black radish is larger, stronger, and crunchier than the familiar red radish. It has a tough black skin and a pungent radish punch. 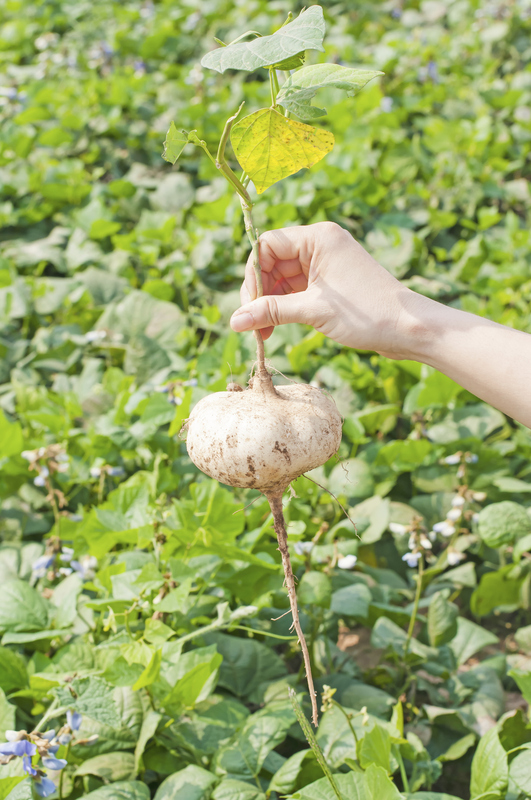 After removing the peel, use black radish as you would the garden-variety radish—in salads or as a snack. It can also be cooked, mashed, and mixed with butter and salt. Black radish also serves as a digestive aid. Its spicy flavor helps improve liver and gallbladder function. Jicama is a Mexican native that you may have previously encountered playing a supporting role in a chopped salad. Its crisp, refreshing flesh is most often enjoyed raw, but it can also be cooked (it is the main ingredient in at least one Vietnamese pie recipe). Jicama is rich in vitamin C and prebiotic inulin. It is often recommended to diabetics to help balance blood sugar. After removing the thin khaki peel, cut jicama into matchstick pieces and combine with red onion, red pepper, cilantro, lime juice, salt, and chili powder for a fun summer salad. These are familiar names, but woefully underutilized vegetables. 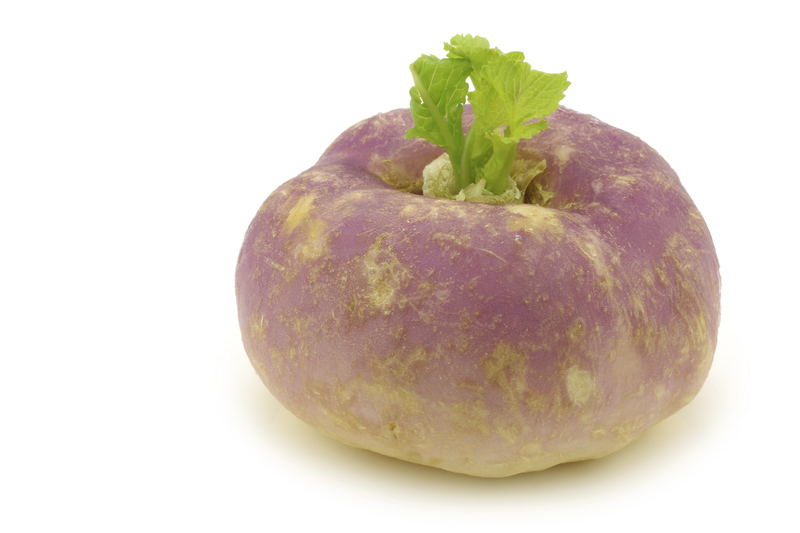 Turnips and rutabagas (stronger tasting as a result of crossbreeding turnip with cabbage) can serve as nutrient-rich potato substitutes—boiled, roasted, or mashed on their own, or mixed with potatoes if you prefer to ease them into your diet. Both turnips and rutabagas are members of the cabbage family and contain much of the same anti-cancer properties of other cruciferous vegetables. These humble roots are also high in vitamin C.
Be sure remove the peels, which are often waxed to preserve freshness. Another subterranean member of the cabbage family, Kohlrabi (which loosely translates from German to cabbage-turnip), may have an otherworldly appearance, but its mild flavor makes it easy to incorporate into the diets of even the pickiest eaters. 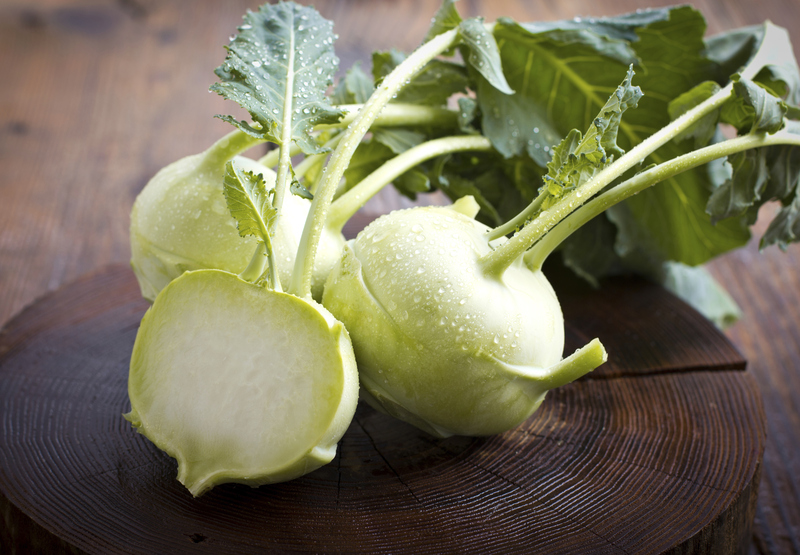 Kohlrabi is high in potassium and other minerals, with a growing superfood reputation. This versatile vegetable can be cooked or thinly sliced and eaten raw. Steamed with butter makes for an easy side dish, or it can be stewed with mustard, cumin, and fennel seeds for an exotic Indian curry. Salsify (also known as scorzonera, goat’s beard, and oyster plant) is a slender root with a dark peel that was once enjoyed by the ancient Greeks and Romans. A relative of the sunflower, salsify was an American favorite in colonial times, back when roots were prized for their ability to outlast other vegetation. Like other root vegetables, salsify fell out of favor in the 20th century with the advent of modern refrigeration. Salsify is high in vitamin E, low in calories, and can serve as a natural diuretic. Like the other roots listed above, salsify is also high in fiber and helps promote good bowel movements. Salsify is experiencing a resurgence among foodies, so you may be able to find some at your local farmers’ market late in the season. Its emerging hipster reputation is due to a unique flavor said to be redolent of oysters, but much more closely resembles artichoke hearts with a touch of sweetness. The tomatoes at Lebanese fast food spot Naya Express taste like tomatoes. The arugula tastes deliciously bitter.